Chinese and American cultures are strikingly different, but one FIU alumna has made the transition look easy. She is proof that FIU’s Marriott Tianjin China Program prepares its students for success in the United States. Since its inception in 2006, the China-based, FIU-run program has produced more than 250 students like Margaret Fan ’10, MS ’12: Chinese nationals who earn bachelor’s degrees on their home turf and then head stateside for master’s degrees at FIU’s Chaplin School of Hospitality & Tourism Management. Fan is currently a training manager at Royal Caribbean Cruises. While working toward her BA, Fan became certain she wanted a job in a headquarters office in the United States. So in 2010 she came to Miami to continue her education. Luckily for Fan, she arrived with a cheat sheet for American culture. While studying in the FIU program in China, she spent hours each day working with American professors and American exchange students. That taught her about a number of important differences. The exchange students she met showed her a different lifestyle and approach to learning. For example, “Chinese students focus on scores, but [exchange students] have a better balance between life and school,” Fan said. The American students, she found, took a more nonchalant approach to classes and were more concerned with job experience. Many took time from class to go on trips around China. “Chinese students are more disciplined,” Fan said. “They sit up straight, and most students will show the professor they’re paying attention. But American students are more casual. They are not as nervous as the other students in the class.” Fan suspects Chinese students are nervous because they have a greater pressure to graduate on time. As part of that effort, most do not work during their schooling and so never get a chance to use their knowledge in a practical way before graduation. 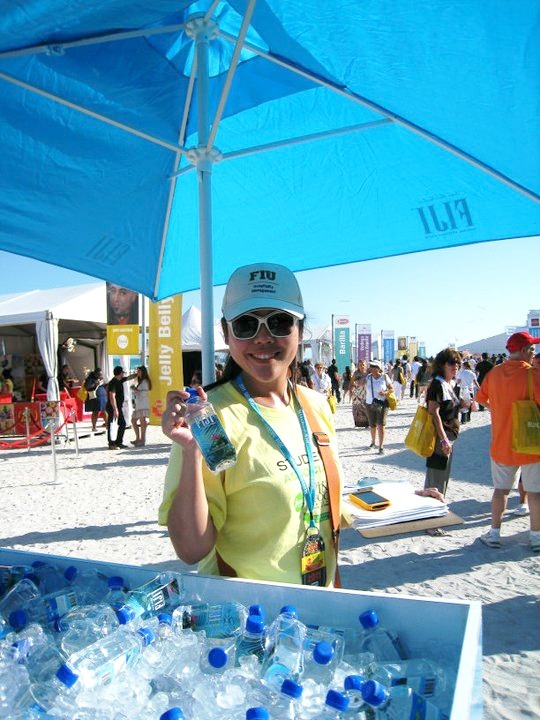 FIU’s hospitality undergraduates in Miami, on the other hand, must take internships and find part-time jobs within the field as a part of their training. All the insight she gained as a student in Tianjin helped Fan adopt the mentality of an American student when she finally arrived in the United States to purse the master’s. Life was no longer strictly about school and grades, she understood, but also friendships and work. She used her outspoken nature to develop bonds with her American professors, who helped her gain experience working at the South Beach Wine and Food Festival and, eventually, land the job at Royal Caribbean. Fan encourages her Chinese peers to come to the United States, even knowing it will take most of them a while to get comfortable. Where she herself adapted easily enough – “For me it feels like I have a switch, on and off” – she recognizes that it’s not quite so natural for everyone else. And while she jokingly admits that learning to like American-style Chinese food is one of the most difficult things for any Chinese student to do, the rewards of immersion are invaluable, both for purposes of working in the industry and for personal satisfaction.